This week we have a guest post from Pippa. Pippa is 14, active on social media and well… a bloody good writer. We wanted a different view of social media from those young folk… the ones who’ll run our country one day and the ones we look to for trends and “what’s next” online. All we asked Pippa to do was write about what social media meant to her and how important it was. That’s it. Simple quesiton and we got a great answer. Before I dive into the depths of social media and what it means to me I would just like to thank the one and only Todd for allowing me to be one of the first guest writers on his blog. I’m honoured but really feel the pressure to be just as good if not better than @SocialMediaTodd himself! Social media: What is it? Why do we care for it so much? And why is it that the first thing we do in the morning is check our phones? The sad reality is that we need social media; it fuels us and we use it to contact friends, build businesses, and to make mistakes – I know I have. But is it really a sad reality? Is it sad that people have started a new life thanks to Twitter, and thanks to tiny things like a board on Pinterest named “Designs”? For me, a teenager, social media has helped me become who I am. It’s helped build my personality. I live everyday with my sidekick, Depression, and his best friend ED. When I’m feeling low I go into the bright and colourful Grand Hall of Pinterest and search things such as ‘simple sketches’ or ‘hair and beauty’ and that cheers me up enough to get out of bed, get dressed and maybe even crack a smile. In 2009 I joined social media… Yes, I was eight years old. The reason for this being that my dad had just died two years before and all of my siblings were on it. I needed a distraction; a coping mechanism. Enter Facebook. My first status being, and I quote; “la la la la la la la,” Yeah… My tiny, little brain was singing. Facebook asked me what was on my mind, so I told him. Social media is where you can be yourself and just sing if that’s you! The truth is, while writing this I’m flicking back and forth between Facebook, listening to Joe Dolman’s playlist on YouTube, making plans on Snapchat to meet a friend, and of course, drinking a cup of tea, because who can do anything without tea or coffee? Joe Dolman, for example, is now working full-time, when not at Uni, doing gigs and earning money for it too. He has a YouTube channel, Facebook page and Twitter account with regular updates about upcoming gigs, new songs and just normal stuff that any guy his age would say. His voice is amazing and he sings from the heart. Definitely worth having a look! But most importantly, Joe uses social media to his advantage. I like to see social networking as a party and everyone is invited… if you’re cool enough. There are expectations to meet. But anyone can meet them. You can create a whole new person. You can be whoever you want to be! 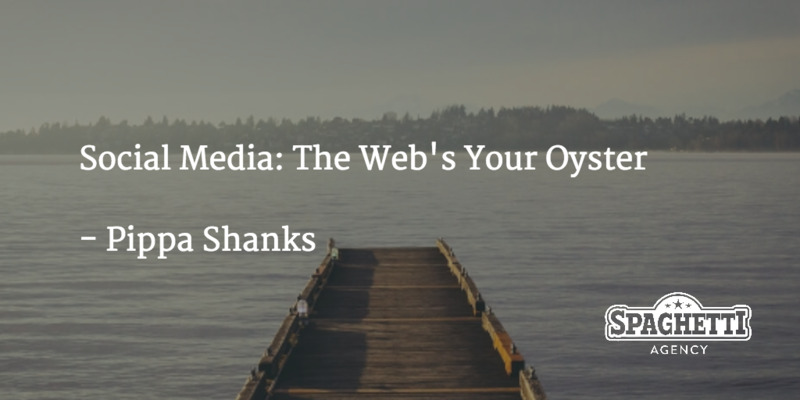 The web is your oyster! I, personally, think I could live without Twitter, Facebook, Instagram, Snapchat, Pinterest, Tumblr. The only thing being is I wouldn’t be able to express myself like I am now. My anxiety is too bad. You can say anything behind a computer screen (in moderation) because you don’t have to deal with the shocked look on people’s faces. You don’t have to deal with the judgment. Screw people that tell you social media rots your brain. Screw people that tell you nothing good comes from the internet. Think about the millions of pounds raised by charities online. Every time there’s a natural disaster in a less fortunate country, Facebook asks me to donate. Remember that stupid Ice Bucket Challenge, the BBC reported, “From 29 July to 28 August this year ALS received $98.2m – compared with $2.7m donated during the same period last year. So, there. I, Pippa Shanks, have just spilled my heart out and I’m not going to clean up the mess! Hello! My name is Pippa-Peita and I am 14 years old. I love to sing - you can't shut me up! Pippa what a beautiful post 🙂 I know how hard it is to live with depression. Mine began when I was a similar age to you and I’m now a very ancient 50! It comes and goes in my life, but I have learned that it can be a great teacher and catalyst for change. Social media helped me through my last big depressive episode and I try and use it every day. I have used Twitter to promote the book I wrote about drug free ways to overcome depression while I was recovering from that breakdown. See it works, we are connecting! I would love to check out your book, please send me a link to your blog. Wow, Pippa, what a powerful and extremely articulate post. I would never have guessed you’re only 14! That isn’t meant to be patronising as you write with such maturity and honesty. If you haven’t already heard of it/tried it, I can highly recommend an app called Headspace (mindfulness meditation), which you may find helpful. What a powerful post from a young and inspiring mind. Absolutely awesome post Pippa. Totally agree about social media helping with depression and anxiety – I really needed links/friends on Facebook to help to see a future when things were really tough. You are inspirational – keep blogging! That’s a damn fine article Pippa, very well written and very mature. I really get where you’re coming from with the fact that social media can allow some of us to express things we might find difficult in other situations. In my personal experience, having a stammer, I can usually type faster than I can speak. I can type words I might otherwise avoid because I find them difficult to say. I don’t have to worry about getting stuck, I can let the words flow. The ‘social media me’ is a lot closer to the ‘real me’ than the ‘speaking me’, if that makes sense? Great blog Pippa, really enjoyed reading. Being the fabulous age of 37 I can remember the world before the internet; social media; and all that has come since. Also being a mother to 3 wonderful children (6,4 & 1), I realise it will be a mandatory part of their lives. I do sometimes think that their youth is lost to the digital world, as it’s all about youtube, minecraft, tablets, apps, games, online portals, but then it is my job to regulate that and make sure that they are making mud pies in the garden, playing superheros and climbing trees. I know that I have a responsibility to my children; one which my parents didn’t have to teach me, one which I have to learn myself and that is to use social media wisely, to not abuse it or it’s users and to respect it’s power. It would be interesting to hear your take on the flip-side. Lovely post, well written and full of honesty. Writing is a great therapy.